The central problem of reinforcement learning is to fit the parameters of an agent's policy in order to make the agent chose "good" decisions according to some unknown objective. Let's consider a very simple case. We have an MDP which is basically stateless. So to say, all the world is doing is to map the actions of an agent directly to a reward. Consider this function to be a mixture of two gaussians, with one mode at -3 and one at 3. Say we pick a single mode gaussian as a model of the world. After fitting our model to our data, gathered via a rollout, weighting it by the reward - we will get a gaussian that has a mode somewhere around 0. A better strategy for an agent would be to just stick to one of the modes. Even though this model of the world is not more correct, it does lead to a better policy. Picking 0 as an action will lead to a reward of approximately zero while always picking -3 or always picking 3 will always return 0.5 as a reward. Under the assumption of a single mode gaussian and via the maximum likelihood approach, a non optimal solution is picked. Of course, there are superior methods. For example, one could estimate the gradient and just move up to one of the modes. But what happens if the gradient information is incomplete? This can happen if our world has time dependencies which are not modelled (e.g. non markovian environments). It can also happen if our observations are not complete but only partial (as in POMDPs). In that case, direct methods are prone to fail, again. Imagine our world to be only accessible through a proxy, which happens to turn the complete state information into an observation via a many-to-one mapping. For example, two different states s and s' map to the same observation o. However, the rewards r(s) and r(s') are completely different, say -1 and 1. In that case our sampling will lead to a completely wrong impression. Stochastic search does not suffer from this problem. A direct method uses an approximation of the world's dynamics consisting of the observations and the rewards as well as the current agent's policy in order to generate a new (hopefully better) policy. A simple hill climber uses only the current policy and its expected reward. Since the non-use of local information does keep it from making wrong decisions due to wrong information, it is in theory more robust if the environment has a lot of wrong local information. Now if this computation takes 20 hours and I'm running this on my laptop, one of the CPU cores is hogged and the fan goes berserk. So what happens if I want to take my computer somewhere else or view a movie? As it turns out, I can simply suspend the machine and after waking up the program will continue to run. This already solves the first problem and shows that the operating system can suspend my program out of the box. The bash shell (and I'm sure other shells, too) helps me with the second problem: It is able to do basic job management. Consider the following command sequence. This lists my temporary directory and pastes it through less. less will wait for my input. extra_link_args=['-framework', 'OpenGL']) # Note the "', '"
So, the '-framework OpenGL' has to be given as two parameters for distutils. Nice to know. Python is slow in terms of execution speed. Period. It is fast enough for most tasks out there, but when it comes to number crunching or manipulation of lots of objects, you can hear the interpreter grind its teeth. Python advocates have a lot to say on how to handle these situations. The most common is "you can always rewrite that particular part of code in C". There are other recommendations: "Just import psyco", "Try to write your whole app in RPython", "Pyrex is impressive" and so on. All of these possibilities do have some additional requirement, though. You will have to learn how to use these tools. Being fluent in Python alone will not be enough. The other day I had a very narrow bottleneck in my Python code. It was all about checking what the first ball of a couple of balls is, in which a given n-dimensional point lies. "A couple" stands for several millions in this case; let's call it N.
If you know scipy, this will be easy stuff for you. If you don't: it's just measuring the distance from the query point to the center of a ball and checking wether that distance is greater or less than the radius of all balls. The function returns as soon as it has found one ball. The tricky point about this is, that the Python interpreter will make a for loop over N numbers and call a builtin (dot) in every loop. Once the builtin is called, Scipy's nature as a C extension speeds things up. But what if the whole for loop could be written as a builtin? That's what we could do by writing it as a C extension. And when code greatly decreases its cache misses, things start to become really fast. In this case, speedup was of about several orders of magnitude. The function itself was faster by factor 2**12; the whole program started to run 60x as quick as before. Furthermore, there were no caveats. Everything worked out of the box. On the first call of the function, the above code was compiled, which slowed down the first call. But once it is compiled (and weave caches compiled code over several interpreter sessions), things get pretty fast. C++ is a great programming language. It allows you to mix the most important programming paradigms like object orientation as well as generic, functional and structured programming. Another nice aspect is that the compilers are efficient and with some black template magick, you get some of these things for almost free at run time. However, one of the greatest features of C++ can hurt you: When you write your own classes, they meld into your source code as if they were built-in types most of the time. However, always remember what is going on under the surface. Today, I was hacking away at an OpenMP parallelization of a shortest-path algorithm (Highway Node Routing by Dominik Schultes) for my student research project. The algorithm needs to perform a lot of Dijkstra single-source shortest-path searches. This part of the parallelization comes almost for free: Use a Dijkstra object for each thread and you're done. OK, so I ended up with the following code in ConstructionClass::doConstruction() before adding #pragma omp parallel. So far, so good. I compiled the program and let it run and the construction time went up from 2 seconds to more than 2 minutes! What was going on? The problem was that the construction/destruction of the Dijkstra object for every loop took long: Whenever you do not use the new operator, you allocate objects on the stack and they get freed whenever the stack shrinks so it does not include the object any more. Side node: Note that Java cannot do this — you cannot control where your object get created and because of garbage collection you cannot predict when the object is actually freed. However, writing the code in C++ hid that fact from me since custom types look almost as built-in types. You could get the same problem with any class that does complex things in its constructor and destructor. For example, the following two pieces of code are equivalent and memory allocation is expensive! Note that I made a grave error of thinking before writing this article: I forgot the copy-on-write page sharing of modern Unices. I added two paragraphs to this article that should clarify the point. Thanks for your comment, Alex. Please note that I do not want to critizize Jason here. I am simply picking up this point from his presentation as a motivation of a topic that I wanted to write about since the issue with Ruby and threads occured. Also note that I actually like Ruby a lot and I am using it in almost all of my projects either for support scripts or as the main programming language: I am not anti-Ruby. Today, the Riding Rails weblog linked to the slides of Jason Hoffman's tutorial Scaling a Rails Application from the Bottom Up in one of their entries. I have not attented his tutorial and thus I might misunderstand him. I might not be proficient enough in system and computer architecture. Nevertheless, I am wondering about the scalability of pure processes. 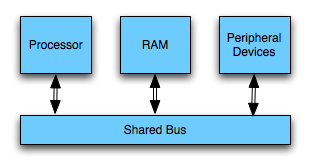 There was a quite a discussion about Ruby and real kernel multithreading some time ago, but I did not read an article covering the same aspect that is discussed here: Memory Bus Saturation. Let's recap the textbook definitions of threads, processes and adress spaces. Note that they do not necessarily map to what vendors call them or are consistent over all text books. A thread is pure activity, i.e. the information about the current position of execution (instruction pointer), the registers and the current stack. An address space is a range of addressable memory that is only accessible by activities that are allowed to read/write from it. A process consists of an address space and one or multiple threads. OK, what does this mean? Each program that you run on your computer runs in its own address space if you are using a modern operating system, for example your web browser and your email client. Both applications (processes) appear to execute concurrently, i.e. you can download a web page and send an email at the same time. Even within each process, you can have multiple activities — threads. For example, your browser might download two images from a web site at the same time. Your operating system executes the applications seemingly concurrently by using time slicing, i.e. assigning each process/task to the CPU for a short time and then assinging the next one. Where is the real difference between processes and threads? Well, two threads within the same address space can access the same memory address at the same time. For example, both of the threads downloading an image can access the list of images for a website document. The thread from your email applications cannot access this list. If the web browser and email client want to communicate, the operating system has to provide means for this. Communication could be done through files, pipes, sockets or message passing within the operating system. Whee, that were a lot of new terms, eh? 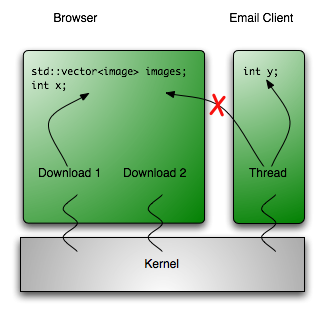 I have two other ones for you: kernel level threads and pure user level threads. 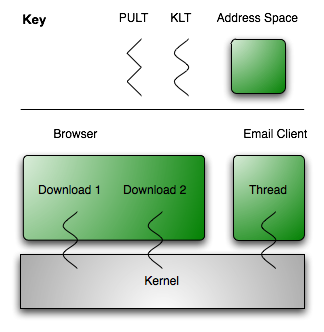 A kernel level thread (KLT) is a thread that the kernel is aware of, i.e. the kernel can decide which KLT will be schedule (assigned ot the CPU). 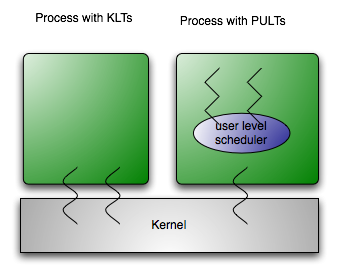 Pure user level threads (PULTs) are not known to the kernel: One or more PULTs may run on top of a KLT and the kernel can only schedule the KLT. The decision which of the PULTs is scheduled is left to the user level scheduler in your application. There are some tradeoffs between PULTs and KLTs and there are even hybrid models but the following problem remains: The kernel can only schedule KLTs to run on a given CPU. If you have more than one CPU/core then the kernel can schedule two KLTs to run concurrently. For example you could decompress two JPEGs at the same time in your web browser if you have two cores on your CPU. Ruby only offers PULTs. What does this mean? This means that you cannot have one Ruby process with two threads running at the same time. You cannot, for example, let a Rails process generate two differently sizted thumbnails of an uploaded image at the same time. You cannot answer more than one request at the same time without stopping the other thread. You cannot do numerical computations on more than one core at the same time. So, we are coming closer to the problem that I see with Ruby and the upcoming 64+ core CPUs that DHH would welcome ``any day'' (so would most of us, right?). Try the following: Start the Ruby interpreter and a Rails console with ./script/console. The plain Ruby interpreter uses 1.2MiB and the Rails console session uses 28.42MiB on my Os X box; your mileage may vary. I have not done any measurements but consider the following: Each of your Rails process needs 1.2MiB of memory for the interpreter and then more propably more than 20MiB of memory for your application instance. Some of this memory will be actively used in the inner loops of your program, let's make a conservative guess and say that each of your processes needs 0.5MiB of the address space most of the time. If you have a 64 core CPU then you need 32MiB of L2/L3 cache to access the memory quickly. A typical L2 Cache on a Core 2 CPU with two cores is 4MiB of size. We could do some simple calculations and get that by the time, we have this 64 core processor, our L2 cache will have a size of 128MiB. After all, Wikipedia tells us that by 2007/2008 we will have 6MiB of L2 cache for two cores. However: First, there are some physical limitations to the size of a cache hierarchy since electricity can only travel that fast. Second, as good engineers, we should consider whether we could cut down the memory requirements with sufficiently little work. How would a multithreaded Ruby help to save memory? Well, the Rails console session used all of its memory by declaring classes and doing some initialization work. Most of this memory could be shared by multiple threads since you normally do not modify your classes on the fly in production systems. Your interpreter could be shared, too. By the estimates above, we could save more than 31MiB of cache for all the stack data we want. Note that we could also save this memory with processes when forking at the correct time: When a process creates a child process, old Unices copied the whole address space. This is no longer the case: Modern Unices allow read access to the old address space from the new address space. When a memory location is written to by any process, the page will be copied into the new process' address space. Thus, if our Ruby/Rails classes do not change and we fork after Rails' initialization is complete, all of our 64 processes can share the same data. I added this and the previous paragraph after the original article has been published because Alex reminded me of this fact in the comments. Thanks to him, the singlethreaded Ruby world is all fluffy again — mostly. A multi process system still has some traditional disadvantages like a higher cost of context switching (which could be negligible for interpreted languages like Python and Ruby). Additionally, we can ignore inter-process communication costs since Rails is share-nothing. What could happen is that we have to access a very large set of memory positions irregularly. If this happens on every core then we might get 64 cores accessing the bus at the same time because some piece of data is missing. This data might overwrite necessary information about a class in the cache and force this data to be reloaded again... If all cores shared the same data this would not be such big an issue. Do you think my logic is wrong and my arguments are weak? Do you see a solution or workaround? I would be thrilled to read your comments. Acknowledgement (2011-11-21): You should search Google for your blog titles before hitting "publish". When I wrote this article some years back, "hitting the memory wall" was just a term I had read some time earlier and internalized for myself as a standing term, like folklore. This was wrong. There is a paper from 1995 by WA Wulf and SA McKee with the same title: Hitting the memory wall that I was not aware of to this day. Thanks to sam in the comments for pointing this out. Sorry, for being late with the acknowledgement. You have always ignored the internals of CPU properties like the number of registers, the exact format of CPU words, the precise format of intructions and of course the cache. I know you have (well, let's say I am sure about 99% of you out there). I ignored this for a pretty long time, too, when programming (although I was lucky enough to be forced to learn about the general principles at university). And it has always been enough for you, right? Your enterprisy Java programs ran nicely, your beautiful literal Haskell programs zipped smoothly along and your Ruby and Python scripts ran with whatever speed the interpreter made possible. Your C(++) programs ran well, too, didn't they? At least they did for me (ignoring bugs) - until now. I ignored the CPU internals, kept to common programmer's sense and best practice. I made sure my sorting algorithms ran in O(n · log(n)), searching ran in O(log n) and generally made sure that all algorithms algorithms were in polynomial time and the constants in big-O notation were small. I thought I was happy and no problem would occur to me. And so you might think. Think again. I was working on parallelizing Counting Sort, a simple integer sorting algorithm that runs in linear time and needs O(n) additional space. For each integer from 0 to max_key, count the number of occurences in the input array. Then, determine for each of these integers, where the first one will be written to in the sorted array. Third, copy the elements from the input array into a buffer array at the right positions. At last, copy the elements from the buffer back into input array. Note that the algorithm is stable, i.e. the order within the elements with the same keys is preserved. This property is important for its application in the DC3 algorithm for linear time Suffix Array construction. Also note that we copy back the elements from the input instead of simply filling up the result array with the keys we determined earlier. The reason for this is that the input array could be an array of objects which are then sorted by a certain integer property/key. So, where is the problem? Counting Sort! One of the simplest algorithms there is. Taught in undergraduate courses or in school! Can it get simpler than that? Where can the problem be? I wanted to parallelize the DC3 algorithm using the shared memory with OpenMP. DC3 needs a linear time integer sorter to run in linear time and the reference implementation uses counting sort for it. So I threw in some parallel instructions: Line 14-16 were executed for each thread, i.e. every thread got an equally (plus minus one) sized part of the input array and counted the occurences. Afterwards, the threads were terminated and the master thread calculated the "global prefix sums" so all threads got the right positions to write to. Then, lines 21-22 were parallelized again. The parallelelized code can be found here. So, we get a speedup of about 1.5 with two threads but afterwards, there is no speedup at all. We should expect a speedup of n with n processors in these two parts since these sections were completely parallelized. So, what the heck is happening there? The main memory is accessible via random access and stores machine words. 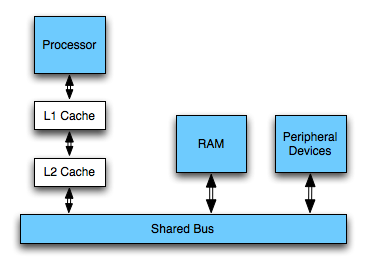 The bus connects main memory, processor, peripherical devices. Only one connected entity can use the bus at any given time. The processor loads data and instructions from the main memory and executes it. Additionally, the memory bus bandwidth in the system is 6.4 GB/s (however, as usual with bandwidth you will not be able to actually transfer more than half of that data per second in a real system). So let us see if we can explain the behaviour with the knowledge about the architecture and these numbers in mind. Lines 14-17 are executed 224 times in total and because ints are 4 bytes wide, this makes 226 bytes = 64 MiB transferred from memory if we only consider arr - c is small enough to fit into the processor's cache all the time (even one copy for each core). With one thread (i.e. one processor working), 64 MiB get read in 30 ms which means that 2.133 GiB/s were read. With two threads working, the 64 MiB get read in roughly 20ms which manes that 3.2 GiB/s were read - the memory bus is saturated, our algorithm gets memory I/O bound and has to wait for the slow SD-RAM. Now, let us try to transfer that calculation to lines 21-22 - it should be pretty easy now. Again, we can assume that c can be kept in the level 1 cache all the time. This leaves reading arr and writing to buffer. Note that buffer is more or less accessed randomly (depending on the order of the values in arr). However, there are only 127 positions in buffer that are written to (limited by the size of c) and thus we can keep these positions of buffer in the L2 cache. We would expect lines 21-22 to take twice the time than lines 14-17 because there are twice as much memory accesses. However, it takes thrice the time with two threads where we would expect the bus saturation. It gets even a bit faster with more threds although we would expect the bus to be saturated already! What is happening? Programs use virtual addresses to address their variables and these virtual addresses have to be translated into physical addresses. The data in the cache is addressed physically so access of main memory requires a resolution of a virtual address into a physical address. The addressing is done page wise, e.g. in chunks of 4 KiB. Each of these pages has a virtual base address which has to be mapped to its physical address (the place the page resides in RAM is called page frame). The operating system has a table for each process that has the mapping from virtual page addresses to physical ones. This table resides in memory, too, and has to be accessed for each memory access. Parts of these tables are kept in a special cache: The so called Translation Lookaside Buffer (TLB). The TLB of the system is again separated into two levels, the faster one is approximately as fast as the registers, the slower one as fast as the L1 cache. Let us explain our results with these numbers. Since the page size of the system is 4KiB, we only have to look at the page table every 1024th memory access in lines 14-17. This very few times and we can neglect the access times since they are few and fast (since the L1 TLB is hit). In lines 25-26, we transfer 128MiB in and out of the RAM. This should take us about 40ms but the lines take use 60ms. However, since access is almost random, we expect to look at the L2 TLB almost every time we want to access buffer. This means looking at it 224 times with 1.28ns each. This simplified calculation yields 21ms for the TLB accesses which seems right considered that we will hit the L1 TLB some times, too. Whee, I do not know about you, but I would like to see a summary of all this to wrap my mind around it properly. We examined the parallelization of counting sort, a simple linear time sorting algorithm. The algorithm could be parallelized well but the parallel parts did not yield the expected linear speedup. We considered current, modern computer architectures and could explained our experimental results with the specs of the machine we used and the knowledge of the architecture. Note, ladies and gentlemen that we are crossing the border between algorithmics and system architecture here: Sometimes, actually implemented algorithms behave different from theoretical results (which indicated a lineare speedup). So, what's next? We could try to kick our "slow" sorting algorithm into the virtual nirvana and replace it by another one. But which one should we choose? Counting sort needs exactly 4 · n + O(k) operations for an array with the length of n containing values from 0 to k. Any comparison based algorithm like Quicksort would need much more operations and parallelizing them comes at a pretty high overhead. Bucketsort exhibits the same non-locality when copying back elements and Radixsort needs another stable sorting algorithm like counting sort internally. If you, dear reader, know of a better linear sorting algorithm then please let me know since it would solve a problem for me. We could use a NUMA machine where each processor has its own memory bus and memory. After splitting the input array, each processor could sort its part in its own memory. However, the final result composition would be slower since access to other processor's memory is slow and we have to go through one single bottlenecky bus again. I hope you had as much fun reading this article as I had analyzing the algorithm and writing the article. I think that I have not made it clear enough above that the algorithm actually is cache efficient. Everwhere, memory is accessed, it is only accessed ones and in streams (every entry of c points to a part of buffer and this can be considered a stream). Each of these streams is read/written sequentially. This seems to have been hidden by the description of modern computers' architecture above.